Replacing carpet isn't something that typically catches a homeowner by surprise. Worn spots, holes, dirt tracks, soaked in stains... these are good indications that it's time to start setting aside money for new carpet. Shopping for carpet can be fun, so many patterns and textures and colors! It can also be stressful because you want to make sure you're getting the best carpet for your budget. When it's time to replace your carpet, turn to the experts at Indianapolis flooring store Kermans. 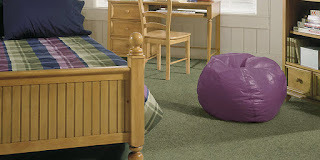 We have a wide range of carpet choices that fit a wide range of budgets. 1. Buy the best carpet type for your lifestyle. Carpets come in four basic types: loop, cut pile, textured and pattern. The key differences among these carpet types are the style of yarn. The twist and cut of the yarn plays a big role in how well it handles traffic. If you are putting the carpet in a high traffic area, you're going to want a highly twisted or textured carpet because it will last longer. If you are putting the carpet in a low traffic area such as a guest room or formal dining room, you could go with a softer, plush cut pile or velvet carpet. Learn about the different types of carpet ahead of time so you walk into the store with a focus on getting the best carpet for your lifestyle. 2. Consider a wide range of colors. Just because the carpet you're replacing is beige, doesn't mean the new carpet has to be. Today's carpet manufacturers have worked in colors, patterns and designs that fit any decor. If you're replacing your carpet, take some time to consider what color carpet fits your style. Many of our customers are surprised at the range of choices in carpet design. Textured carpets that subtly bring in a range of color shades. Patterned carpets that can be a beautiful focus point in a room. Bold, bright carpets that can make a design emphasis all their own. Your carpet design can make a room look larger or smaller. The color and design of your carpet can also impact how well it looks after years of use and traffic. Move beyond basic carpet colors and you'll discover a whole new range of choices that help you bring your own sense of style into a room for years to come. 3. Review all the details. Carpet padding. Where carpet seams will be placed in a room. Stain protection. Yarn density. There's more to carpet than meets the eye. If you want a carpet that will look nice and last for years to come, you want to make sure you cover all the details. This is why you want to shop at a store like Kermans Flooring in Indianapolis. We don't expect you to walk through our doors as a carpet expert - that's what we're here for. Our floor is staffed with design consultants that can help you through every step of the process from selecting a carpet type to measuring for installation. It's just one benefit of the Kermans Advantage. The Kermans Advantage means that our expert consultants offer unparalleled customer service and recommend just the right flooring selections depending on your budget, type of foot traffic, and living space. When it's time to replace your carpet, turn to Kermans to help make sure you get the best deal for your budget. Top manufacturers. Excellent customer service. Prices for any budget. Kermans Flooring Indianapolis has been the best place to buy carpet in Indianapolis for decades.